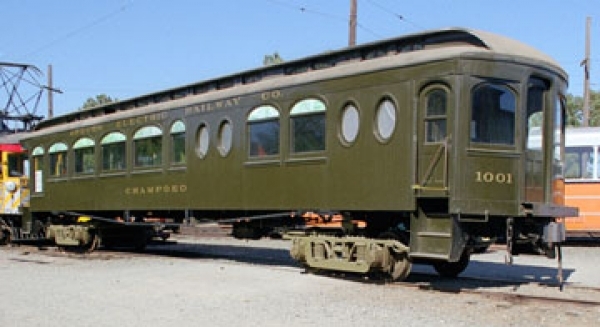 This is Oregon Electric Railway parlor observation “Champoeg.” This is a wooden Niles car with a clerestory roof and empire ceiling. It had traction motors and General Electric type M control when in service on the Oregon Electric. 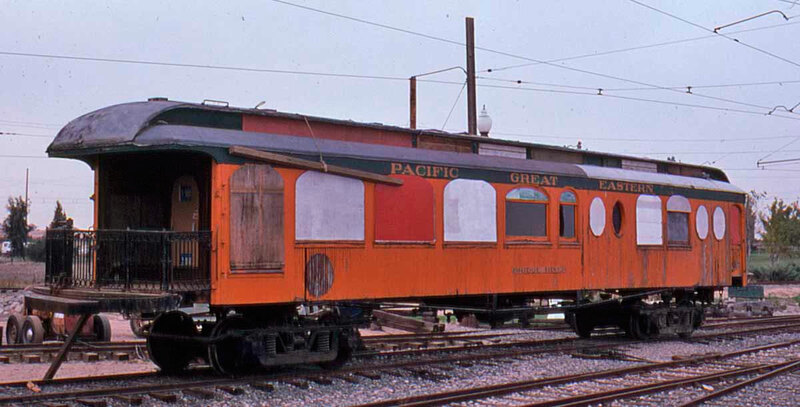 This car was one of two parlor cars on the OE; the other was car 1000, Sacajawea. The Oregon Electric ran 122 miles from Portland to Eugene down the east side of the Willamette Valley. Car Champoeg was placed in service on October 15, 1912 operating in three car limited trains. The trip from Portland to Eugene took about 4 hours with the cars running around 45 MPH. Passenger service ended on May 13, 1933 and Oregon Electric sold the Champoeg to the Pacific Great Eastern Railroad in British Columbia. The electrical equipment was stripped and the car was renamed the “Bridge River.” The “Bridge River” served as a Business or Officers car for the PGE. In 1956 the PGE sold the Bridge River to the Willamette Valley Electric Railway Association. The car was moved to Glenwood, Oregon where it deteriorated badly until it was acquired by the Western Railway Museum and moved to Rio Vista Junction in 1974. Owners: Oregon Electric 1001. Pacifc Great Eastern Railroad. Technical Data: Wooden parlor observation car. Built by, Niles Car and Manufacturing Company of Niles Ohio in 1910. Seats, 30 passengers. Total car weight, 88,700 pounds. Trucks: Baldwin 78-30 B. Wheels, 36 inch. Axle. Journals, 5 X 9 plain bearings. Traction motors, 4-75 horsepower @ 500 VDC, inside hung. Air Brake Equipment: Westinghouse Traction Brake, AMM. Motorman’s valve, (M24A). Triple valve, M2B. Double check valve, #15. Brake cylinder, 14 X 12. Air compressor. Dimensions: Width, 9’ 2”. Length over buffers, 62’ 5”. Height, 13’ 4”. Truck centers. Truck wheelbase, 78". Propulsion Equipment: General Electric type M. Master controller. Switch group. Traction motors; originally, (Four GE 73C, changed to two 73C and two 205E 600/1200 when road changed from 600 volts to 1200 volt trolley voltage). Control switch. Power resistors. MU plugs. Misc Data: Couplers, Sharon radial, 5 X 5 shank, with AAR contour. Currently coupler has a fixed carrier. Heaters. Trolley wheel. Trolley base. Current Condition: The exterior has been restored in the Museum’s shop to its Oregon Electric appearance. It is usable in a train. 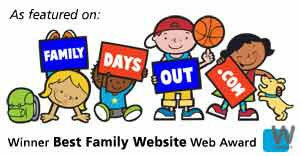 Proposed Future Treatment: The interior needs to be restored and the electrical equipment installed. All necessary parts are on hand.